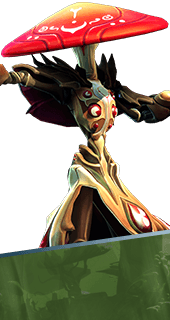 Cloud of Spores is an Ability of Miko in Battleborn. Throw a spore sack that explodes on contact, dealing 139-187 damage and leaving behind a cloud of spores that slows all enemies that enter it for the next 4 seconds. Intensifies the slowing effect of Cloud of Spores. +100% Slower. Cloud of Spores drops spores along the way to a target, covering a larger area. Increases Cloud of Spores' impact damage. +15% Damage. Enlarges Cloud of Spores' area of effect. Cloud of Spores lingers longer after bursting. +6 Seconds Duration.